When sewing from a pattern, cut out the pieces you will use and press out the wrinkles with a dry iron. 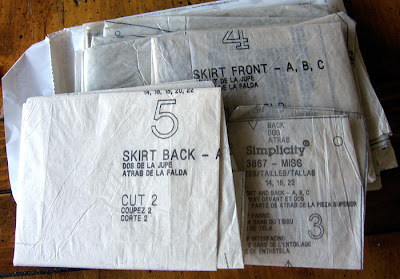 When storing the pattern pieces fold them to fit in the envelope with the number facing up. This makes finding the pattern pieces very easy the next time you use it. I put the pattern pieces I'm using inside the fold of the instructions and then slide it all into the envelope. The little pieces go in easily and when I pull out the instructions all the pieces I need are right there. 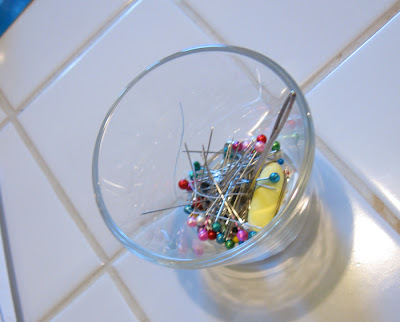 I keep an IKEA tea light holder next to the sewing machine to hold pins and other useful notions. It's really handy. Always keep scissors handy. For me, this requires multiple pairs. 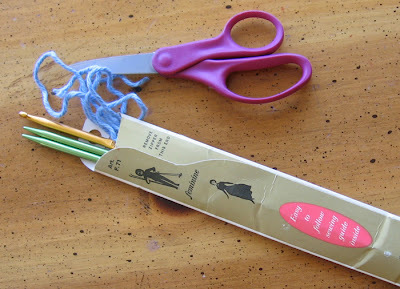 Tie scraps of yarn into little loops and use as stitch holders when knitting.